Happy 4th of July… Here is a Paper Doll! Happy 4th of July! There are a lot of 4th of July printables out there, but I don’t see a lot of 4th of July printable paper dolls and is there anything better than a paper doll activity for the small ones coming to your bbq? I’ve been thinking a lot about the 4th of July, also known as Independence Day lately. Politics in the United States this year have gotten horribly vicious, I think everyone can agree. It’s a strange thing to see. But the 4th of July should be a day when people in the United States can celebrate the fact that even when our politics get nasty, we’re still living in a pretty fantastic place. So, I’m pretty proud to be American, even though right now I’d like to get to stop hearing about our Presidential elections. Actually, I was sick of hearing about the Presidential elections about four months ago and we’ve got a long way to go it feels like. And that is all the politics you’re going to get from me today. 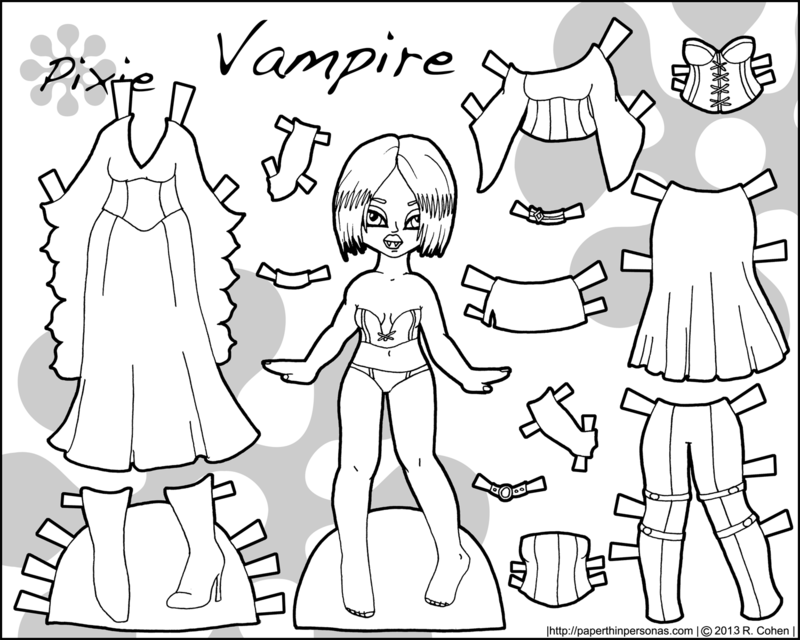 Meanwhile, here’s a 4th of July printable paper doll! In a change of pace from my other 4th of July paper dolls, I went with short hair. I had fun with cookout accessories including a burger and a drink. I was going to draw a hotdog, but did you know? Hot dogs are actually really very hard to draw. Huh. I don’t think anyone will be shocked that I went with a red, white, and blue color scheme. So, I was originally going to color the drink like it was lemonade, but it looks kinda unpleasant once it was colored, so I went with a sorta coca-cola color. May everyone have a great 4th of July if you’re celebrating or a delightful Monday if you’re not. 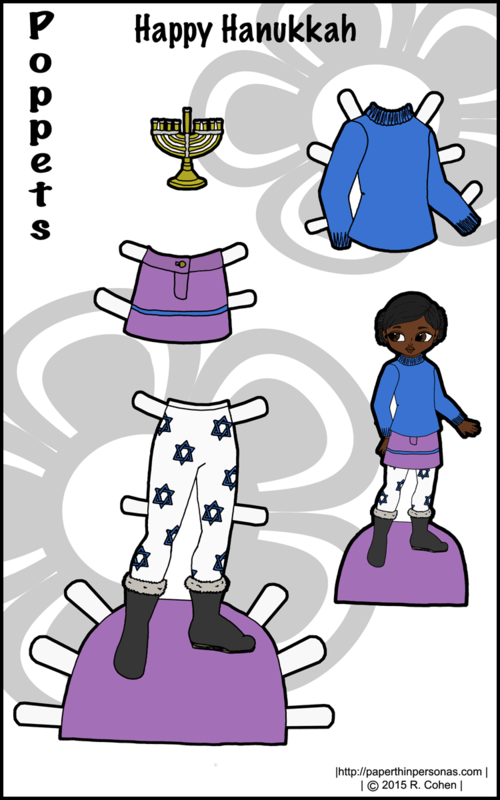 A Hanukkah Printable Paper Doll! Happy Hanukkah to everyone like me who is celebrating tonight! It’s the Sixth night of Hanukkah tonight and I’ll be lighting the candles in my window and saying my prayers at sundown. 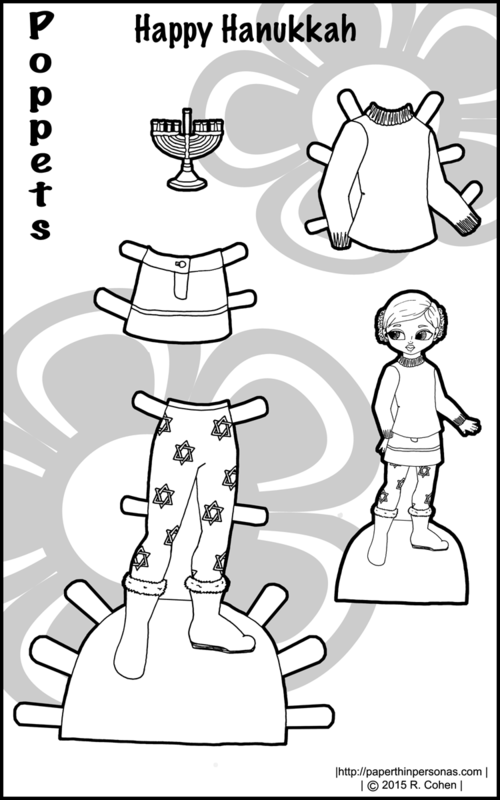 Some of you might be playing with this set of Poppet paper doll clothes. I always tell myself I am going to do a Hanukkah paper doll and then I never seem to actually pull it off. This year I managed it. I chose the Poppets, because Hanukkah tends to be most celebrated by those with children. Plus the Poppets are dolls and I can imagine that dolls might be given as a gift and that seems fitting. For the holiday, the Poppets have a sweater, tights with Stars of David on them, and a purple skirt trimmed in blue. Of course, they also have a menorah. A menorah is a candelabra that usually holds nine candles. Eight candles are for each night of Hanukkah, and the ninth candle, which stands usually taller than the others, is to light the eight candles. It is called the shamas. So, every night you say prayers, light the shamas and use it to light the other candles. Chabad has a nice FAQ about the holiday, if you want to know more. Frankly, drawing a menorah is actually rather hard. I ended up drawing half of this one and then using photoshop to duplicate it. I don’t think it came out very well, but there is always next year. I keep telling myself I will be organized enough to do something special over the holiday, like Julie at Paper Doll School does during her month of December post. I never seem to really get around to it. The Holidays are just such a busy time for me. I hope that whatever holiday everyone is celebrating this time of the year (or no holiday, that’s cool too) is filled with friendship, family and fellowship. For the next two Friday’s I’ll be giving the Poppet’s some Halloween costumes. 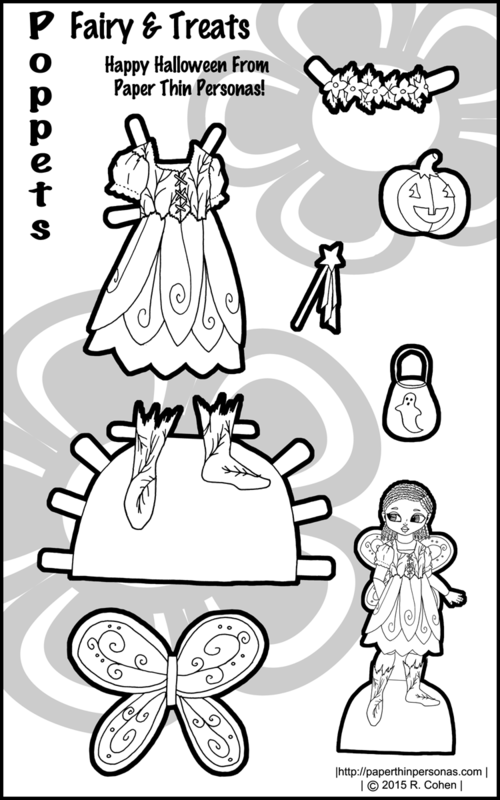 Today, we have a fairy and next week, there will be a pirate for these printable paper dolls. So, when I draw things like fairy paper dolls they fall into one of two categories- “Real Fairies” or “Fairy Costumes.” Sometimes I am creating a printable paper doll of a fantasy creature like a mermaid or a fairy and that is a different idea than creating a Halloween costume of that creature. So when I created this fairy costume, I was thinking strictly of it as a costume sort of experience, rather than an actual creature. I hope that makes sense. Despite this the wings are intended to be glued to the back of the paper doll or you could use double sided tape. I realize this means they are non-removable, but over the years I have come to conclude that this is the best way to attach wings. I have tried other methods, but they don’t seem to really work very well. Plus there is nothing stopping you from printing several of the Poppets and having “winged” and “normal” versions. After all, that’s part of the power of printable paper dolls. They can always be re-printed. Modeling the fairy costume is Petal, one of the Poppet paper dolls. Of course, any of the Poppet dolls can wear the costume. Halloween is my most consistent paper doll holiday. 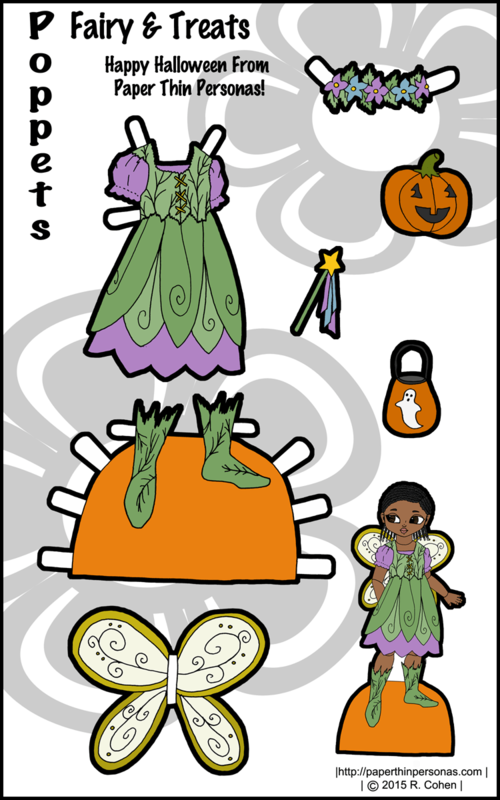 I’ve done Halloween paper dolls every year starting in 2010. In no real order, they have been a vampire, a costume set, a ghost, another vampire, and a collab between me, Boots, Liana and Toria. Tomorrow at midnight EST our Paper Doll Round Robin closes. The guidelines are all explained here. Please join us! We’ve had some great contributions so far and we hope for more. 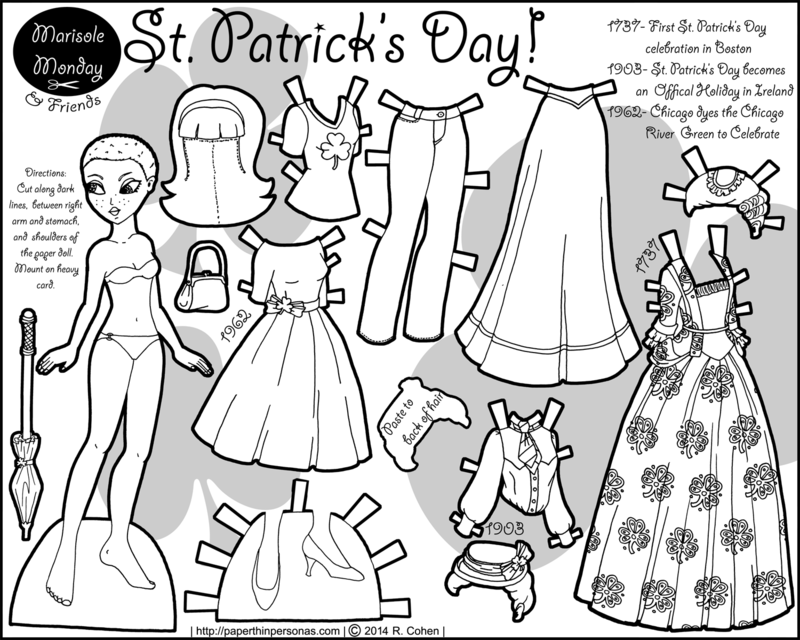 Over the years, I have done a lot of Valentine’s Day paper dolls. 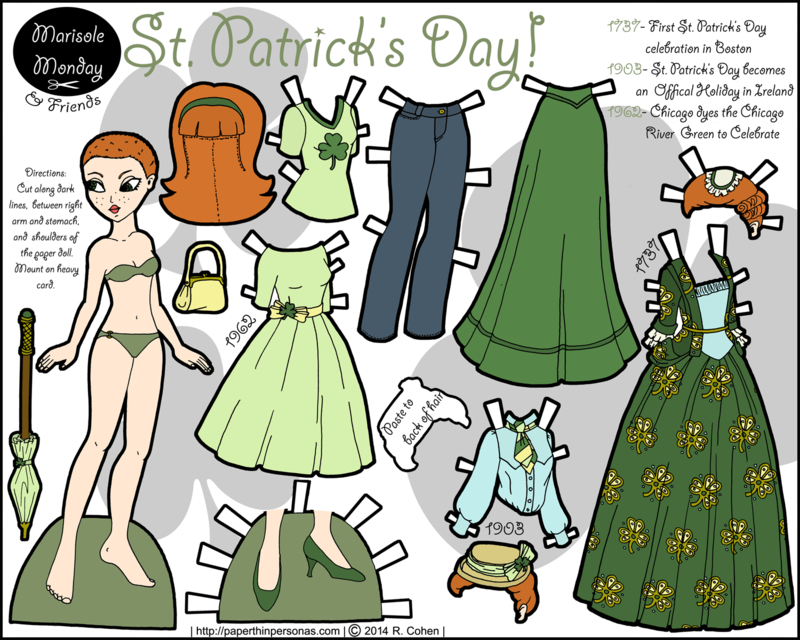 I think it might be the only holiday that I reliably get a paper doll posted for. 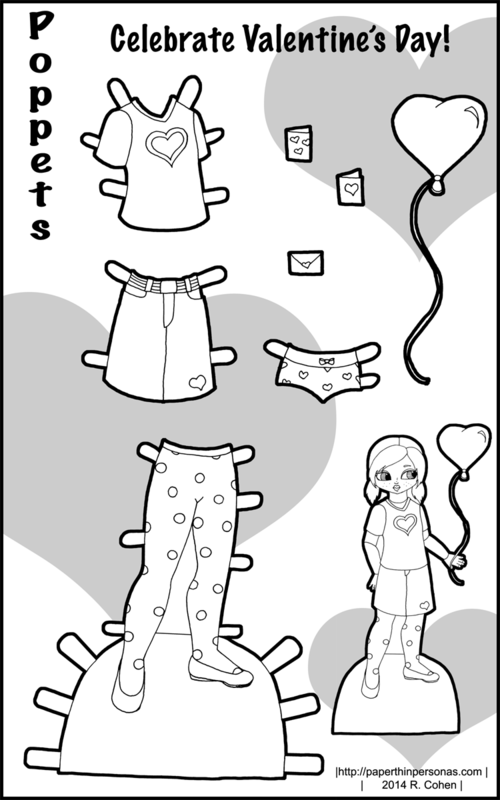 My first Valentine’s Day paper doll was back in 2011. 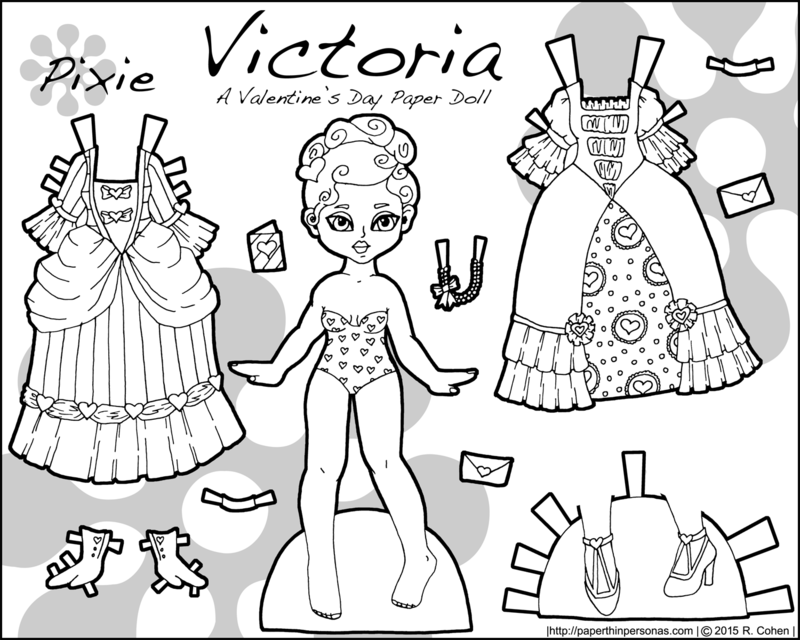 Then in 2013, I did this black and white Valentine’s Day paper doll. In 2014, the Poppets got a Valentine’s Day themed outfit. This year, I wanted to do something a little different. Inspired by Victorian and Art Deco valentines, I designed two 18th century inspired gowns with a Valentines Day theme. Hearts, of course, but also stripes and polka-dots. Plus ruffles. Ruffles are very important. Our paper doll got a wild up-do and a heart encrusted bodysuit to wear under her gowns. After all, it is the season for both wide up-dos and heart bodysuits. Originally, I planned on using a traditional red, pink and white color scheme. However, I just didn’t like how bright that made the dresses. So, I went to ColourLovers and searched for a scheme that was a little more subdued. I ended up using Happy Valentines color scheme. I often use ColourLovers both to find inspiration for color palettes and to build my own color palettes using their tools. I hope everyone has a lovely Valentine’s Day. I am making stew for me and my boyfriend and we’ll be eating it while watching Box Trolls. I am very excited about both the stew and the movie. Meanwhile, there’s supposed to be snow on Monday and I have become a true Southerner, buying milk and eggs, just in case. I certainly wouldn’t mind an unexpected day off work, since I don’t get President’s Day off. This holiday totally snuck up on me. I kept thinking… I have time before I need to worry about a Valentine’s Day paper doll and then I turned around and it was here. 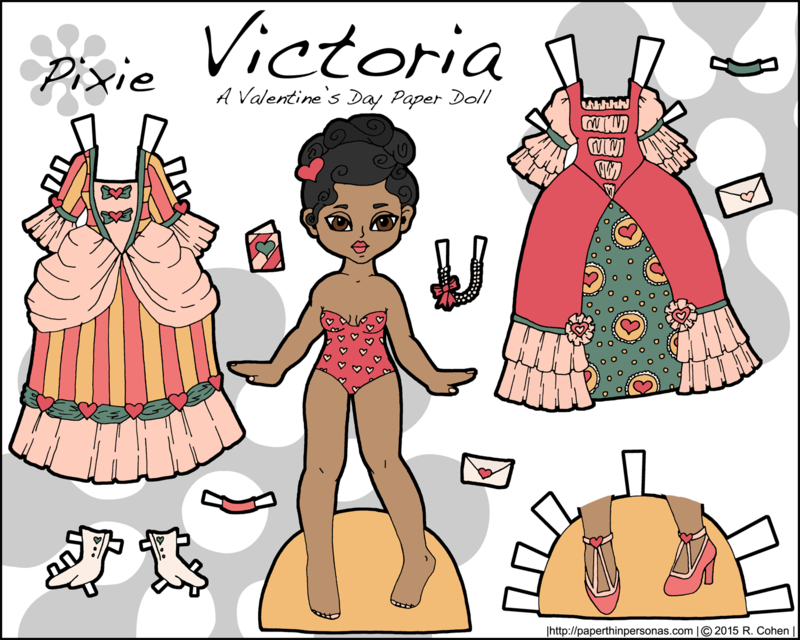 I’ve done other Valentine’s Day paper dolls over the years, and this year I wanted to do a Poppet Valentine’s Day paper doll (partly because I ran low on time and it was easy). 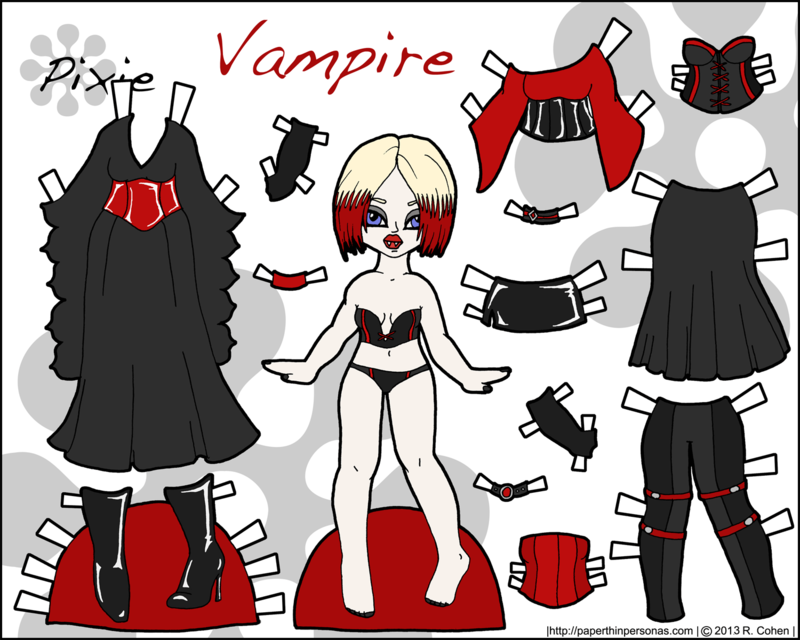 I like only having to draw one paper doll outfit rather than several. It’s very liberating. I have fond memories of Valentine’s Day in Elementary school when my mother would insist we hand make the Valentines and I’d get to play with glitter and dollies and red construction paper. As I got older, Valentine’s Day became one of my least favorite holidays in the real world. I’ve had a series of rather horrible Valentine’s Days over the years, but I am looking forward to a quiet night this year. That seems like the ideal way to spend Valentine’s Day to me. Meanwhile, enjoy the paper doll. Plus, I ain’t gonna lie… I love the polka-dot tights. They’re some of my favorites.